sailboat. 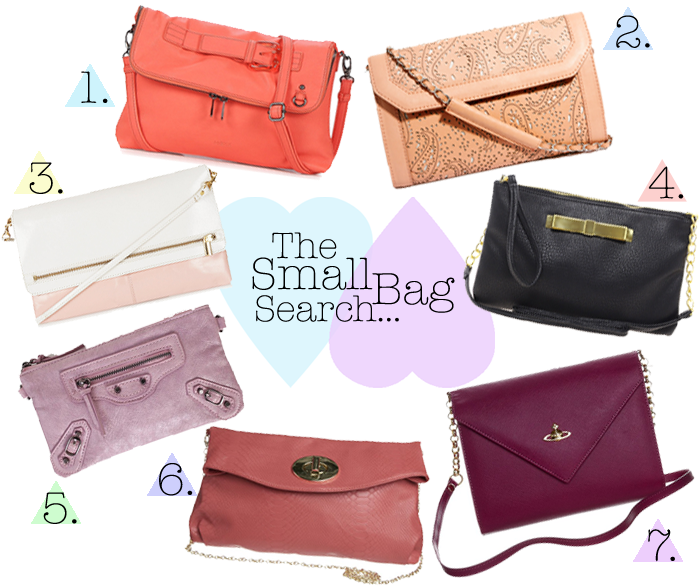 : The Search for the Perfect Small Bag! Who would have thought the search for the perfect small bag would take so long? Turns out, if you tend to be a little picky, it's pretty much impossible to find. If I could afford the price tag of a wallet on chain from Chanel I'd be handing over my card in less than a second and I'd deal with the impracticalities that such a tiny bag can bring later. But since the price of one of those is pretty much equivalent to 5 months mortgage payments and I'd rather have a house than a nice bag, they're a little out of my reach at the moment. All in all, I'm not exactly sure what I'm looking for, do I want something super small that can only fit my cards, my keys & a lipgloss or do I want something a little more substantial that I might be able to squeeze my little point & shoot camera in to aswell? Or do I say sod it & get one of each? Because, you know, a girl needs options, right? 1. Mexx Buckle Bag. 2. Mango Cutwork Clutch. 3. Topshop Colour Block Clean Clutch. 4. ASOS Bow Across Body Bag. 5. eBay Celebrity Style Motorcycle Clutch. 6. Oasis Across Body Bag. 7. Vivienne Westwood Across Body Bag. I am so close to hitting the buy it now button on eBay for this Celebrity Style Motorcycle Clutch, in fact by the time I hit publish on this post I probably will have caved. I almost didn't click on it because I like bags to have straps, but the fact it comes with one has pretty much sold me. It's kind of like the Moschino owl shoulder bag I almost bought but with a longer strap and more room! And for under £20 even if the quality isn't amazing I don't think I can complain too much! The question is though, do I now need something slightly bigger, just in case I need to carry a few more things with me? I love the Vivienne Westwood but it's a little out of my price range & the ASOS bow across body bag is cute, but perhaps a little too plain? The Topshop clean clutch is probably a little too fancy for me, it would be cute for date night drinks but perhaps not so much for a quick dash around Sainsburys and the Mango cutwork clutch is beautiful but I'm not really sure how I would style it. See, I told you I was picky! The Mexx buckle bag is such a beautiful colour & although it's not as small as I was looking for, I think it would be really practical. I also love the Oasis across body bag, the cute chain straps get me every time and I really like that it looks slouchy and casual but still cute. Have you found your perfect small summer bag yet? I actually really really like the first one! I've been into corals lately and I love this for summer and spring! :) Great post! Bags are my weakness, I've got one for just about every occasion! When I just want to carry my cards and phone and what not I've got a little wristlet, and then I can throw it into a bigger bag to lug more things around. Multi-purpose! I totally thought #5 was Balenciaga! Haha :) Lovely picks! I recently bought a small bag as well, it's rectangular-shaped, black with black studs all over. I like that it can double up as a clutch as well. I seriously love every single one of these. It's really put me in the mood for a bag spree. #5 is very Balenciaga. I love #2 and #3, only because I don't own anything like these. Numbers 2 and 5 are so sweet. I have so many small bag sbut strangely only tend to use the large ones. Ha! I used to carry around this ridiculously huge bag and I would take it literally everywhere, but nowadays I prefer a little satchel which isn't super cumbersome aha. I really like number 3 for the simplicity and pastel colours! I love the bag from eBay! I found the perfect small bag in Topshop the other day, it's a lime green colour and so cute. I can completely sympathise-it has has to be perfect for me too :) I must say the Mango clutch is certainly catching my eye!